This blogging stuff can drive ya nuts!! Since I can't seem to put any more pics where I want them, it must be time to start typing. I gave up trying to add a video on the last post, maybe I'll try again some time. The Coca Cola bottling plant is just up the street from where I live. I drive by it every day, to and from work. The other day as I motored by I thought about how Mat, of "Mat Versus the USA" works at a Coke plant down under. So these pics are for Mat. After visiting a website I can tell you that Coke was introduced in the Sacramento California area in 1909. This "Spanish Colonial Revival" building was put up to replace the early 20th century plant. Not far from where the bike shop was on Broadway is Tower Theater, and not far from there is the Clubhouse for the Capital City Motorcycle Club. I've run into guys from this club over the years. It's a family oriented motorcycle club, and according to the website they have, they have gotten back into competition stuff. I'm not sure, but it seems that one of the guys told me that way back it originally started out as a bicycling club. 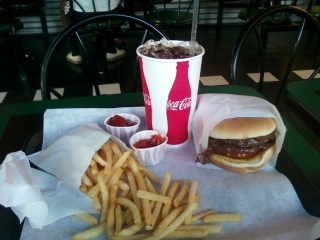 As I headed home I stopped in at Willie's and had a "Slammer" (Chili burger) ,with fries and of course a coke. Nice Larry, it's good to see buildings that look like builldings instead of these glass and steel monstrosities that are posing as building now.